These fender systems are composed by individual rubber elements that allow combinations between them (similarly to type IV). The system requires a steel frame (open or closed and sealed configurations) covered with UHMW polyethylene plates that will be the contact with vessels. The assembly can also include chains, shackles and turnbuckles, depending on needs. This type of fender is made of elastomers with a shape similar to that of IV type fenders but with greater robustness both for fixing to the dock and in the steel frame given the anchoring areas are outside the main body. 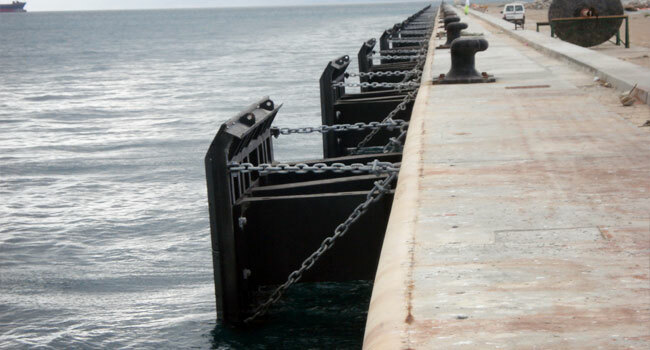 In terms of its installation in the dock, this may be performed both horizontally and vertically and may be composed with two or more modules of rubber in either direction. The most convenient configuration will depend on the final location of the fender and its particular use. The use of this typology of fender is varied and suitable for any type of dock and scope.